A couple of months ago I wrote about how, after someone contacted me about installing Stolpersteine memorial blocks for cousins of mine, I had done further research into what happened to them during the Holocaust (Tracking down a couple that disappeared during the Holocaust). Those Stolpersteine (stumbling blocks) have now been installed in the sidewalk near where the couple, Mindel and Aron Salzman, lived in Cologne, Germany. Someone photographed the installation ceremony and posted the photos to Wikipedia, which can be viewed in a kind of album there. Lastly, it’s worth pointing out two things that seem to be wrong (or at least not clear) in the information in Mindel’s Stolperstein. It says that she was deported to Bentschen/Zbaszyn as part of the Polenaktion, the first deportation of Jews from Germany to Poland, which took place in October 1938. While there is clear evidence that Aron was part of that deportation (see my previous article on this couple), there does not seem to be clear evidence that Mindel was part of that deportation as well. Second, it says both were killed in ‘Occupied Poland’. I don’t know when Aron died, but I do know that while Mindel was killed during the war, she was in fact killed after the occupation of Poland ended (although perhaps one might argue it was then occupied by the Soviet Union instead). As described in my previous article, she was murdered along with a dozen other Jews participating in a Passover Seder in her birth town of Kańczuga, after having come out of hiding during the war. The first is unproven, and the second is a technicality, so maybe I’m being too critical. Overall, I’m happy to see these memorial blocks put into place. This is a story of memory, and how looking to find information on a specific person or persons, especially when they died in the Holocaust, can be very difficult. Stolpersteine (Stolperstein is the singular form), for those unfamiliar with the term, are concrete blocks with brass plates that commemorate people killed during the Holocaust, that are generally installed in the sidewalk outside the last place a person lived before being murdered. 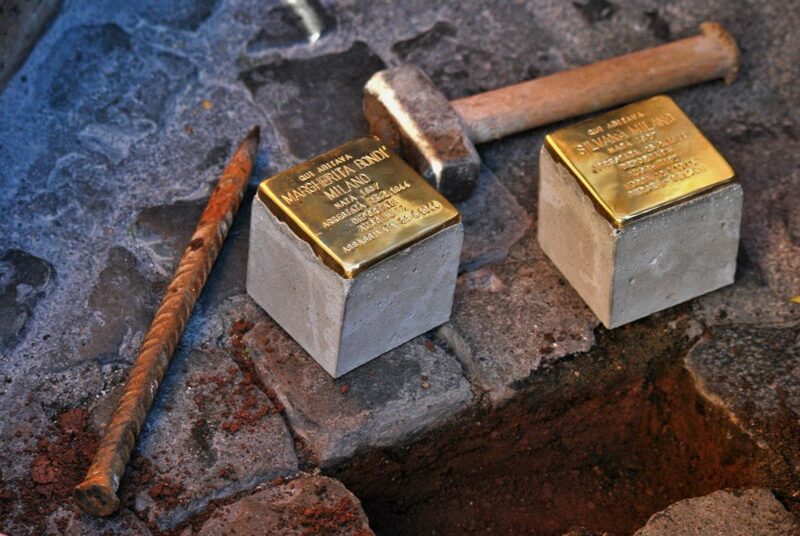 Stolperstein in German means ‘stumbling block’, and the idea is that people living in these place now will stumble upon these memorials which start ‘Here lived…’ explaining that someone who lived in that very spot was murdered during the Holocaust. Started as an art project by Gunther Demnig in 1992, over 50,000 of these memorials have been installed in 18 European countries. The person who contacted me was indirectly connected to this couple, had found me through the family tree on Geni, and wanted to find out more information about the couple before their Stolperstein was installed in a few months time. I knew a bit about the couple, although I had some open questions from past investigations. 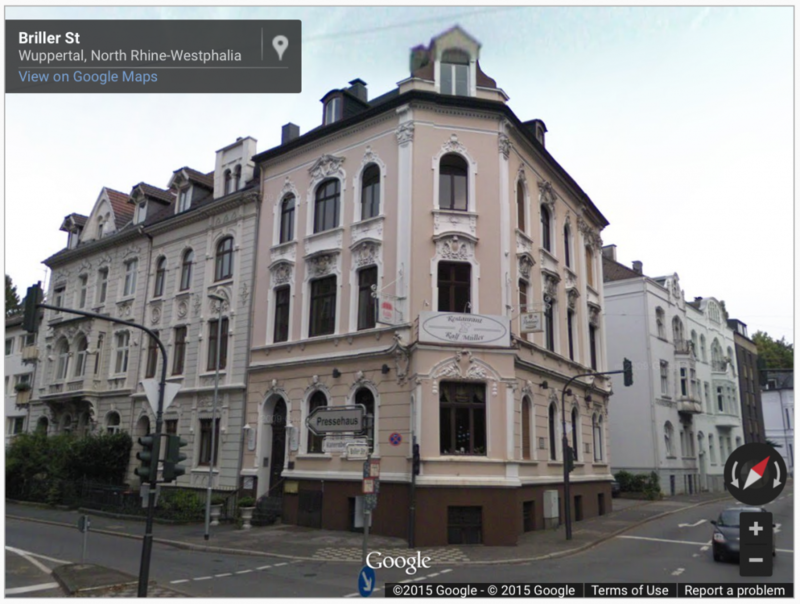 For one, while I knew the couple had live in Cologne (Köln), Germany before the war, I didn’t know what happened to them during the war, or how Aron had died. What I knew about Mindel was that she had actually survived the war, only to be murdered upon returning to her hometown of Kańczuga in 1945. The story is that she was participating in the second Passover seder there, when Polish men (possibly Polish soldiers) came and killed all the Jews. It’s worth pointing out again that this was after Poland was liberated. I wrote last year about a planned memorial for Jews murdered in Kańczuga, including the 13 Jews murdered at this Passover seder, in Memorial for Jews murdered in Kańczuga in 1942 & 1945 and More info about the massacre of Jews in Kańczuga in 1945 on the Kanczuga.org web site. In the memorial Mindel is listed as Mindla Saltzman. Let me back up a minute. My knowledge about this couple comes from a few places. It’s always a good idea when doing research to start at the beginning and what’s more of a beginning than one’s birth? I have a copy of Mindel’s birth record from 1885 in Kańczuga. I retrieved this record many years ago through a record request to the archive in Poland. What can we learn from her birth certificate other than her birth date? It gives the name of her father (Markus Thurm), as well as the name of her mother (Taube Traurig), and additionally the names of her mother’s parents (David and Feige Traurig). Another source of information is a letter from a cousin written over 30 years ago outlining what he knew of our family history. There’s a lot to dissect in that sentence. First, it gives the husband a hyphenated last name, Kesstecher-Salzman. It mentions they had two sons and one daughter “all in NY” which sounds like they were born in NY, or at least that they all lived in NY. It mentions another relative who might know more information, Leo Thurm. and that he survived the war only to be shot when he came out of hiding. So let’s dissect these statements one at a time. 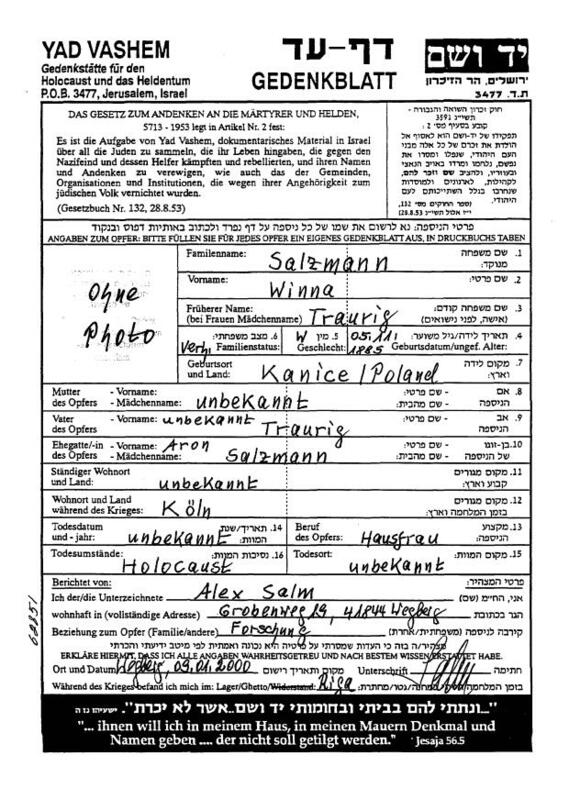 The surname of Kesstecher-Salzman was not really hyphenated, but rather at different times he used the Kesstecher and Salzman surnames. I haven’t been able to confirm the exact connection, but I suspect that like many Jewish families in Galicia, his parents had a religious marriage and not a civil one, and he and any siblings he might have had were forced to take his mother’s surname. That doesn’t explain which name is which, but I would guess that Kesstecher was his mother’s maiden name, and Salzman was his father’s surname. Mindel herself had a similar situation, which I can confirm, as her mother’s maiden name was Traurig and her father’s surname was Thurm (as shown in the birth record above). She and her siblings were all born with the Traurig surname, although at least one (the father of the above-mentioned Leo Thurm) later changed his surname to him father’s surname (after arriving in the US). “All in NY” is a very misleading statement. As it turns out, the two sons were able to make it to the US as refugees, although the daughter was killed in Europe. The parents, Mindel and Aron, never made it to the US. Leo Thurm, as mentioned, is the son of Mindel’s brother. He’s actually 100 years old now and living in Brooklyn. It was certainly confusing to see the husband’s name listed as Urisch instead of Aron. 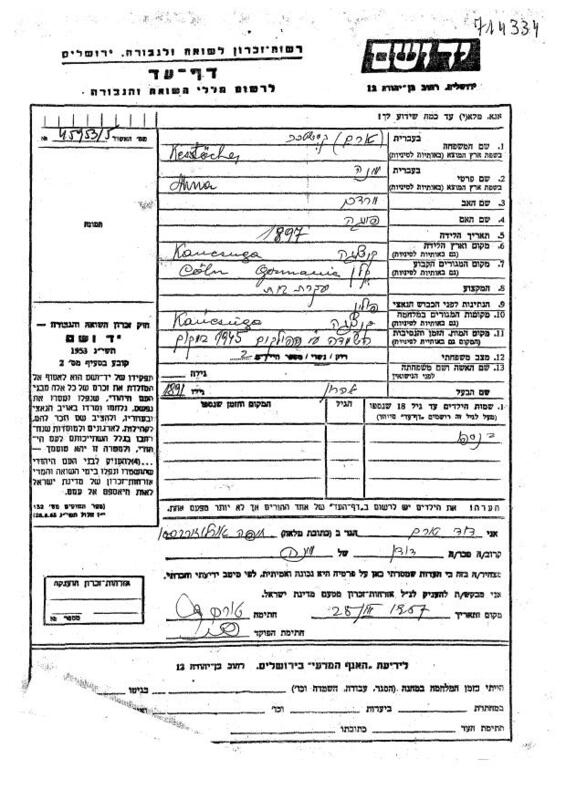 A grandson of Mindel and Aron has said, however, that a copy of a yizkor notice sent to his father, lists their names as Minja and Ourish. It took me a little time to figure this out, but Rabbi Shmuel Gorr lists (in Jewish Personal Names) Arush and Orush as diminutive forms of Aron, pointing out that -ush, -ash, -ish and -esh are all diminutive suffixes. This last part of the statement is questionable. We know, of course, that Mindel was killed when she came out of hiding. Was Aron similarly killed? One grandchild heard he died while in hiding of a stomach complication. If that the case then this may simply have been conflated with the death of Mindel. 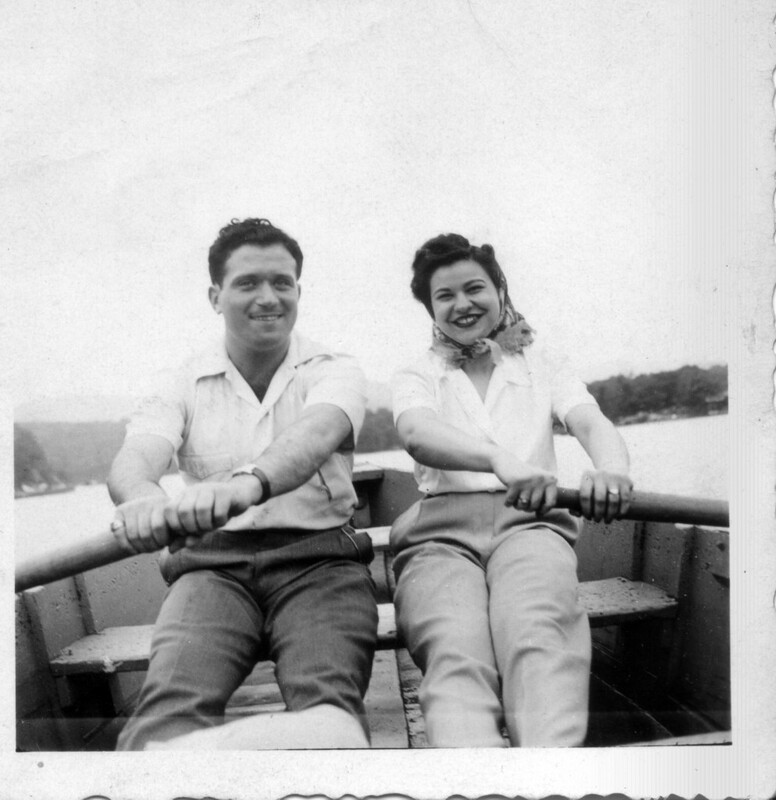 Another source of information on this couple are Pages of Testimony submitted to Yad Vashem. 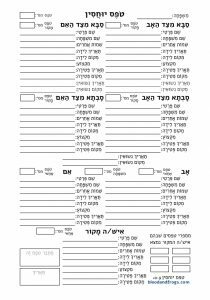 Since the 1950s Yad Vashem, the Israeli Holocaust Museum, has collected forms filled out to commemorate victims of the Holocaust. 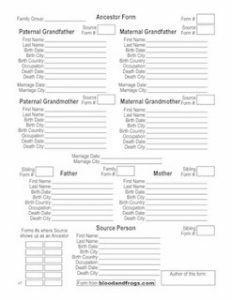 Generally filled out by family members and friends of the victims, these forms give a general outline of the person – the name, the names of their parents, where and when they were born, who their spouse was, where they lived before the war, and how and when they died. Not every form has all of the information, in fact most don’t. Another important piece of information on the forms is who filled the form out, how they were connected to the subject of the form, and where the submitter lived. While the submitter information was likely not intended to be so important, the submitter information does two critical things. First, it gives us as researchers a potential connection to a surviving member of one’s family. The second thing is it connects the Pages submitted by the same person (although there are problems with this, see two below). You might be looking for one cousin’s Page, but by looking at all the Pages submitted by the same person, you might find information on dozens of common relatives. Page of Testimony make up the bulk of Yad Vashem’s Shoah Names Database, searchable on their site. The first column shows you who submitted the Pages, the second column shows you what was submitted for Mindel and the third column shows you what was submitted for Aron. Key data-points, if submitted, are shown next to the image of the Page. The name above each image is the name submitted on the Page. First things first. There is only one detail that all Pages agree on – which is that before the war, they were living in Köln (Cologne), Germany. Seriously, that’s the only thing that is consistent. Let me step back for a moment to give some advice and to point out a problem when looking at Pages of Testimony at Yad Vashem. One thing I always like to do when I find a Page submitted is to click on the link of the submitter’s name, to see what other Pages they submitted. It’s common when submitting Pages to submit many Pages from the same family, so even if you were not looking for other relatives specifically, you might find relatives in the list of other Pages submitted. What I discovered is that one of the above Pages, the Page of Mindel Salzmann submitted by Alexander Vogel, was listed as submitted by Alexander Jogel, and thus not linked to any other submissions (compare the search of Pages by Alexander Vogel and Alexander Jogel). [After pointing this out to Yad Vashem they fixed this particular problem and the record listed under Jogel is now properly listed with the other records listed under Vogel] If you find a single submission (like for Jogel) it’s worth trying to figure out if there is a spelling mistake like this, so you find other submissions from the same person. In my experience, it is rare to find a person that submitted only one Page. So back to the Pages. All essentially agree that the husband’s name was Aron (Aaron is a form of the same name). For the wife, we have Mindel and Minna (a shortened form of Mindel), so far so good, but then out of nowhere Winna. Presumably this is just a mistake and he wrote Winna instead of Minna. Two of the sets of Pages agree that their surname was Salzmann, but one has Kesstecher. I’ve already written above about this inconsistency, but to be clear I believe they were known by the Kesstecher name when they lived in Poland (and were in contact with David Turm) and when they moved to Germany, switched to using the Salzmann name. Only two of the Pages list Mindel’s maiden name, but they disagree on what it was – one listed Turm, and one Traurig. This is easy to figure out, however, as I mentioned above Mindel’s birth surname was Traurig, although her father’s surname was Turm/Thurm. One of the biggest oddities of all the pages are the birth years given in David Turm’s Pages. He lists their birth dates as 1897 and 1891, although both were apparently born in 1885. Alex Salm actually listed them both as being born in 1885, although he duplicates the birthday of Aron for both Aron and Mindel. It’s a pretty big mess. Now let’s look at who wrote these Pages of Testimony. The first set was written by David Turm, a nephew of Mindel. They were written in 1957, 12 years after the war, and perhaps 20 years since he had last seen Mindel and Aron. The second set was written by Alexander Vogel, a son-in-law of Mindel and Aron. Alexander Vogel has married Toby Salzmann, the daughter of Mindel and Aron. It’s not exactly clear when Toby Vogel died, although perhaps it was before the war because Alexander Vogel didn’t seem to submit a Page of Testimony for her (at least that I could find), even though he did for her parents. 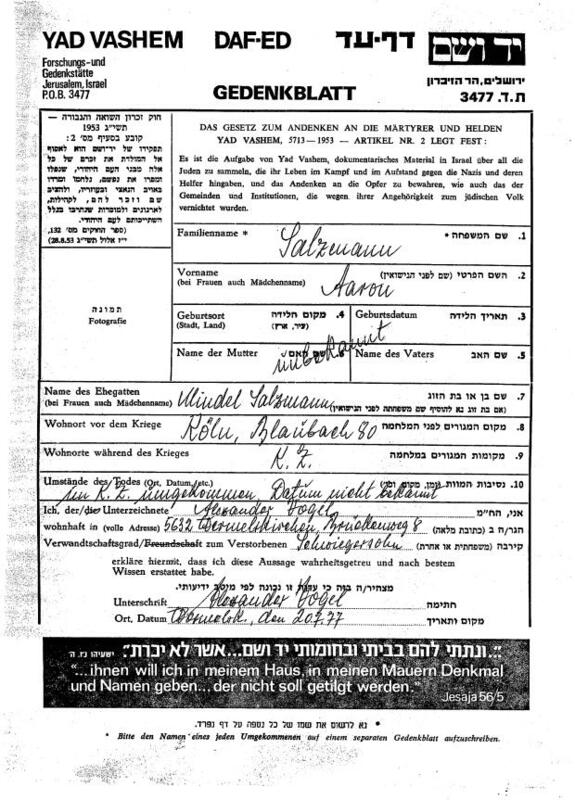 Both Aron Salzmann and Alexander Vogel were deported from Germany to Zbasyn, although not at the same time. I’m not sure if they would have overlapped there or not. Concerning his Pages, they were submitted in 1977, more than thirty years after the war. The third set was submitted by Alex Salm, a researcher seemingly not connected to Mindel and Aron. Interestingly he submitted almost 7500 Pages of Testimony. The two for Mindel and Aron were submitted in 2000, some fifty-five years after the war. Doing some research into Alex Salm I discovered that he was a survivor himself, and he passed away in 2004. So which of these three sources would you consider the most reliable? I think we can clearly discount Alex Salm, who had probably had no direct knowledge of the family, and seemed to have worked from public documents. 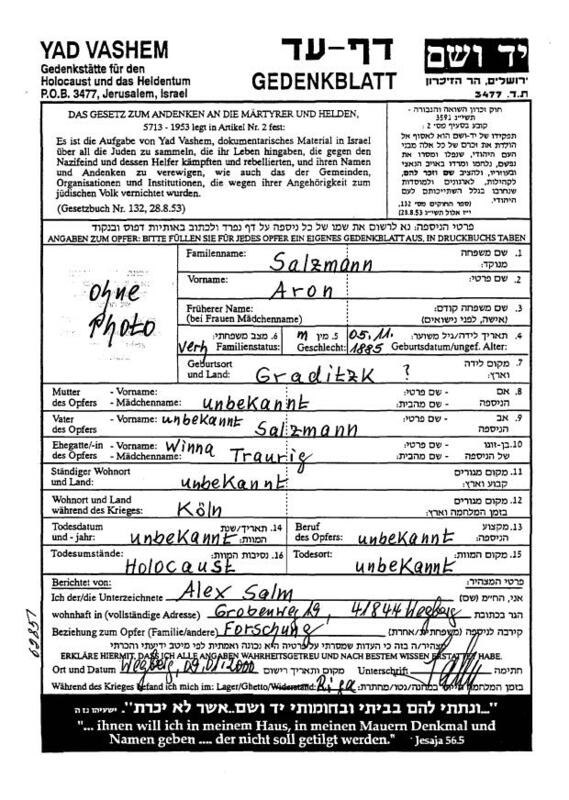 One can find the birth date and location for Aron Salzman in several places, including a list of refugees in Zbasyn between 1938 and 1939, the German Gedenkbuch (which lists the JDC Archive as a source), and the International Tracing Service (ITS) in Bad Arolson, Germany which has a card on Aron Salzmann with the same birth date and location. Since Salm lists the wrong birthday for Mindel, and gets her first name and birth town slightly wrong, it’s not clear what source he was using for this information. Presumably there is something that lists her as living in Köln, Germany that he found. Maybe there is a typo in that document that uses the Winna spelling. Alexander Vogel submitted the least amount of details on his Pages. Either he didn’t know, or he had forgotten where they had been born, his mother-in-law’s maiden name, etc. David Turm gets the birth years off by more than a decade, and didn’t even know that in Germany his aunt and uncle had changed their surname to Salzman. He also lists Mindel’s maiden name as Turm, even though everyone else lists it as Traurig. None of these are particularly compelling. Let’s take a step back for a moment to look at something interesting about these Pages of Testimony. The ones submitted closest to the war were those by David Turm in 1957. As I’ve noted above he was a nephew of Mindel, the son of her brother Simon. David’s immediate family were all killed in the Holocaust, with only him surviving because he had gone to British Mandate Palestine. He had the same naming issue as Mindel, that their surname should have been Turm (I know this name as Thurm because another brother of Mindel made to America, where he changed him name back to his father’s name, and spelled it Thurm). Yet in these Pages, he lists his own name as Turm, and the maiden name of Mindel as Turm as well. According to David’s daughter who I spoke to a few years ago, her father never changed his name from Traurig. For whatever reason, he submitted those Pages under the name Turm, and said Mindel’s maiden name was also Turm (which if her parents had had a civil marriage it would have been). As I usually do I looked at the full listing of Pages submitted by David Turm, and noticed something odd. His immediate family wasn’t listed. Thinking back to what his daughter told me about his name, I searched instead for the list of Pages submitted by David Traurig. Sure enough there is a whole different batch of Pages submitted by David Traurig, just a few months earlier. This includes his parents Szymon Turm and Miryam Traurig. Note that he uses the Turm surname for his father, and the Traurig surname for his mother. That’s a bit confusing. So we see a bit of conflict in his use of the names Turm and Traurig. In his first batch he uses the name Traurig, but names his father Turm and his mother Traurig (presumably because while his father’s name should have been Turm, his mother’s married name was always Traurig). For his siblings he used the surname Turm, even while filling it out with his surname Traurig. What seems to make sense is that while their legal name was Traurig, they considered their surname to be Turm. A few months later when filling out more Pages, he used the surname Turm, and similarly assigns the Turm name to his aunt Mindel, even though she never used it legally. I think we have a pretty good idea of why David Turm used the maiden name Turm in his Page of Testimony for Mindel, but we still don’t know why the birth dates are off. Whether all of this convinces you that three sets of Pages with almost nothing in common all refer to the same couple, I don’t know. When I sent these six Pages to Yad Vashem to ask them to link them without the explanation above, they thought there were too many contradictions to link them. I haven’t heard back from them yet after sending them more or less the same outline as above to convince them they are the same people, but they’re pretty good about responding so we’ll find out soon enough. In case you’re wondering how I know that the two batches of Pages submitted by David Turm and David Traurig were submitted by the same person, in the Pages in both batches where he lists his address, they are the same. I suppose one could do handwriting analysis as well, but I think the address is enough evidence. So what other sources are there out there to find out about this couple? The couple lived in Germany before the war, and therefore if they were killed by the Nazis they should show up in the Gedenkbuch (Memorial Book) that is continuously updated on the web site of the German Federal Archives. As pointed out above, indeed Aron shows up in the Gedenkbuch, listing the date of his deportation from Germany to Zbaszyn, Poland, as well as his detention there. It also says he was declared dead, but doesn’t give any details. Mindel does not, however, show up in the Gedenkbuch. Even though she lived in Germany before the war, she was not killed by the Nazis, but rather local Polish people, and therefore doesn’t make it into the Gedenkbuch. The JDC was, and still is today, a major relief organization operating wherever Jews are in need. Many Jewish refugees were helped by the JDC on their way out of Europe, and records were kept by the JDC are now available online their Archives site. The JDC helped many refugees make it to places like Australia, China, Cuba, and basically wherever there were places willing to accept Jewish refugees. They also helped refugees wherever they were, including as it happens the Zbaszyn internment camp where Aron was sent. 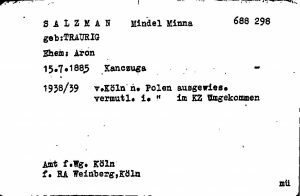 Searching the JDC archives brings up a file listing those assisted in Zbaszyn by the JDC, which includes an entry on Aron. 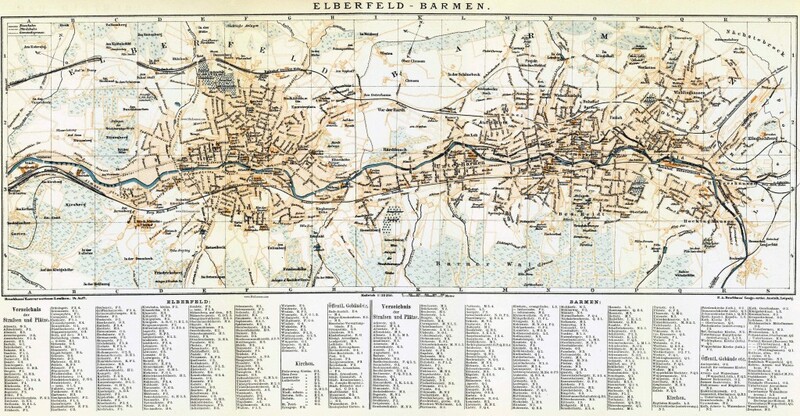 The listing give his birth town and date, his profession, his address in Germany, as well as the name and address of his son who was in New York. If you compare the details to the information in the Gedenkbuch above, you’ll notice they are largely the same, and indeed it turns out that the JDC records were used to help build the Gedenkbuch. Just looking at the Gedenkbuch wouldn’t have given you the name and address of his son, however. It also wouldn’t have given you the exact date of his deportation from Germany. The ITS in Bad Arolsen, Germany is an organization that was set up in the wake of World War II to collect all the documentation related to the atrocities carried out by the Nazis and their collaborators, including concentration camps, forced labor, and documenting post-war displaced persons. The archive contains more than thirty million documents, and for decades helped people trace what happened to their relatives who they became disconnected from during the war (as well as providing survivors the documentation they needed to receive restitution and compensation). 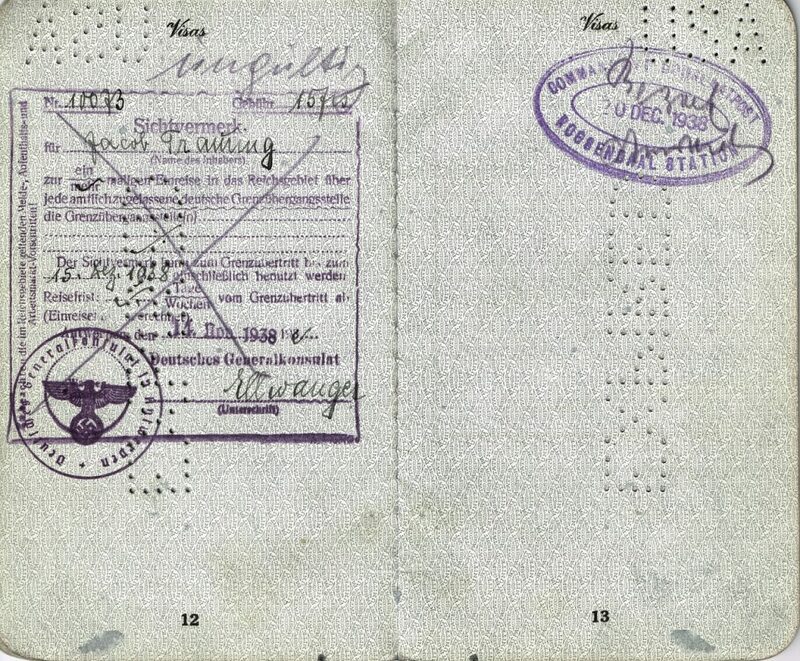 Overseen by 11 member nations (Belgium, France, Germany, Greece, Israel, Italy, Luxembourg, Netherlands, Poland, United Kingdom, and the United States), the ITS traditionally made it fairly difficult for people who were not survivors or direct descendants of survivors to access their information, especially if you were not going to travel to the archive in Germany. Over time, those rules have been loosened, and the ITS has made major progress in digitizing its archive and making those digital copies available to institutions in the 11 member nations. In the US the recipient of those digital copies is the US Holocaust Memorial Museum, in Israel the recipient is Yad Vashem, etc. These institutions have begun efforts to index these records and make them available to researchers in their own countries. In fact, you can request information from ITS through these organizations, such as through the Research Services page on the USHMM web site. Before the digitization and indexing of their records, the primary way that ITS researchers would search for information on people in their records was through a card catalog. For those too young to have used such a system in their local library (where file cabinets were filled with cards with details of the books available in the library), at the ITS this consisted of having a single card with information on each person for whom they had information on in their archive. The cards were presumably organized alphabetically, and each time they found information on a person, they would find the card on that person, and add the information they found, which would hopefully point them back to the document they found that information when needed. It was, clearly, a very labor-intensive process. I was able to locate two of these cards for Mindel and Aron, through a source other than the ITS. I have actually submitted a request to the ITS for information on Mindel and Aron, so at the very least I should receive the same cards from them, but hopefully some supporting documentation as well. There’s not a whole lot of information on the card. 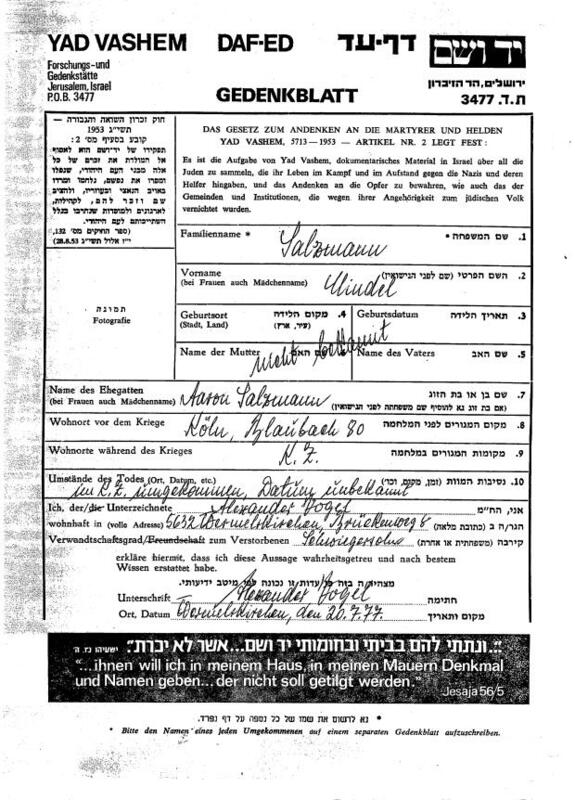 It has their names, Mindel’s maiden name (Traurig), their birth dates and towns (which matches the information in the JDC file for Aron), and that they were deported from Germany to Poland in either 1938 or 1939. Note that we haven’t run into any evidence previously that Mindel was deported with Aron to Zbaszyn. Indeed the next piece of information seems to call this into question, as it seems to say they both died in concentration camps (K.Z. on the cards). We have no story nor evidence that either of them were in concentration camps (other than Zbaszyn which was a kind of internment camp), nor that they died in them. Indeed, we know that Mindel did not die in a camp, but in a massacre in her hometown. This tells us that while the ITS archive is immense, that it is not always accurate. When the ITS responds to my request for records on this couple, maybe they will send associated documents that explain why the card says what it does. Another detail of the cards is that they show a name on the bottom left – RA Weinberg, Köln. RA is an abbreviation for Rechtsanwalt, the German word for lawyer. This seems to indicate that a lawyer with the last name Weinberg in the city of Köln was researching this couple for restitution claims. Could this have been a lawyer hired by the couple’s children? It’s unlikely we’ll ever know, as their children have passed away and their grandchildren were not told very much about what happened during the war (nor anything like restitution claims that their parents may have filed after the war). We’ve at least been able to put together the beginning of an outline of what happened to this couple. We know where and when they were born (Kanczuga and Grodinsk, both in 1885), where they lived before the war (Cologne, Germany), when Aron was deported from Germany (October 1938) and where he was sent (Zbaszyn, Poland), and where and when Mindel was killed (Kańczuga, Poland in 1945). The next step would probably be to research available records in Cologne, Germany to find information on them when they lived there. Contacting more relatives whose families knew them and might have other letters and documents that reference them is also a good idea. 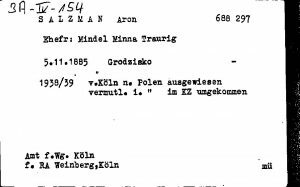 Finding out which Grodinsk Aron was born in (there are several in Poland), and if there are other Salzmann descendants that came from there would also be important, as they may have been in touch with Aron before or during the war. I don’t know if we will ever get a complete picture of this couple’s life (or their deaths), especially where and in what conditions they hid during the war, but as the above shows, it’s possible to find some information when you know where to look, and you are willing to spend the time to reach out to people and organizations. I hope this research effort is helpful to others. If you have more information on this couple, please share it either in the comments below or send it to me directly. I’ve written about my grandfather Jack Trauring a few times before. I wrote Remembering my Grandfather about my thoughts after his death, Friends from Antwerp – and is that a famous Yiddish poet? about his life in Antwerp and photographs of him there, and more recently discussed how his first name changed through various countries in Don’t get stuck inside the box. As today is Holocaust Remembrance Day, I thought I would write a story my grandfather told me about his life in Europe in the run-up to the Holocaust. My grandfather was born in Vienna, Austria during WWI, after his family was forced to flee their hometown of Rzeszow in the Galicia region of the Austrian Empire. After the war that town would become part of Poland, and his family returned there for the early years of his life. At the age of nine, in 1925, his family moved to Antwerp, where he lived until leaving for the US in 1940. My grandfather’s life in Antwerp wasn’t easy, with his father dying just a few years after they arrived there. With his father gone, my grandfather took over his father’s watch store near the docks of Antwerp at the age of just fourteen. Although my grandfather was born in Austria, and had subsequently up until 1940 only lived in Poland and Belgium, he had something that almost certainly saved his life (and the lives of others, see below), a US Passport. His US citizenship came from the fact that his father had been born in New York. In 1884, my grandfather’s grandfather, Isaac Trauring, moved with his family to the United States. At the time he had one daughter, Kreidel Blime (Katey), who was born in Rzeszow. In New York he had three more children, Frances, Morris, and Joseph, and later another child back in Rzeszow, Arno. My grandfather’s father was Morris, and his birth in New York in 1887, provided him and his children US citizenship. 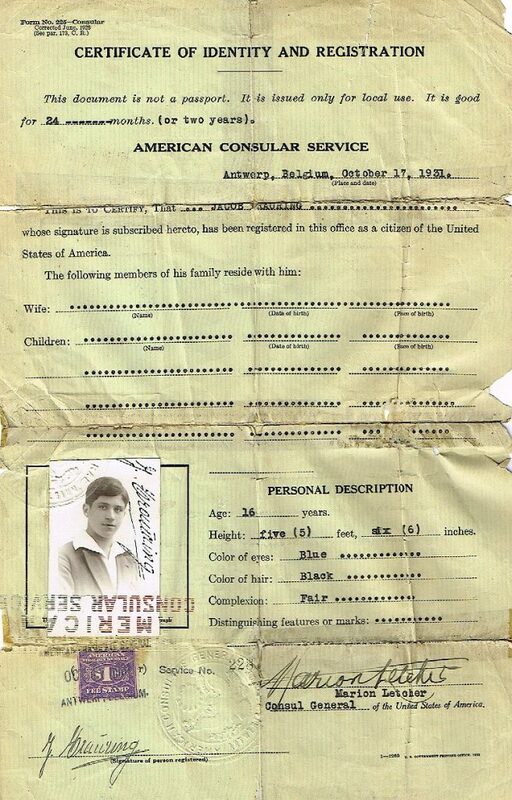 It’s not clear if Morris lived in NY past 1897, when his brother Arno was born in Rzeszow, but I do know that he applied for a US passport in the US Embassy in Vienna in both 1910 and 1914. 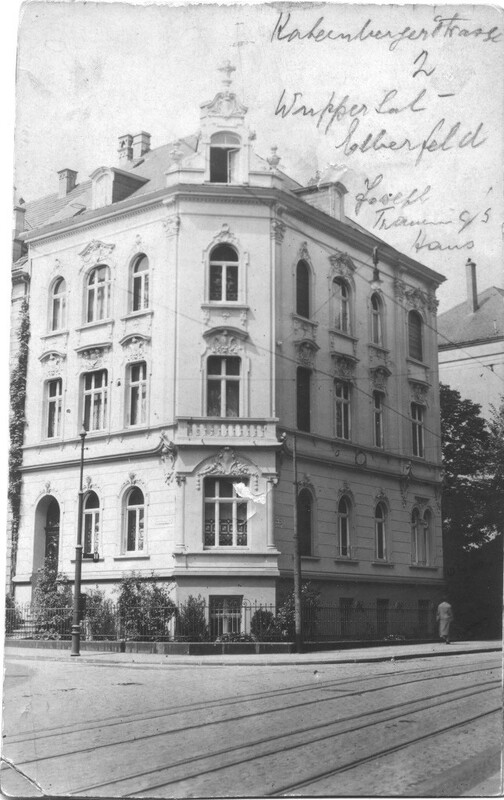 In 1914, his application states that he had been in business in Rzeszow since 1911, and had fled to Vienna after the Russians had invaded. Less than a year after that application, my grandfather would be born in Vienna. Some years ago I spoke to my grandfather about his experiences in Belgium, and he told me that before the war he traveled to Nazi Germany to try to get his younger cousins out of Germany. My family had many relatives in Germany before the war, especially in Cologne and Wuppertal, and while some of them had been able to flee the country earlier, some had not be so lucky and were now not allowed to leave. Without a country willing to accept them as refugees, it was impossible to leave Germany, and no countries were taking in Jews at that time. 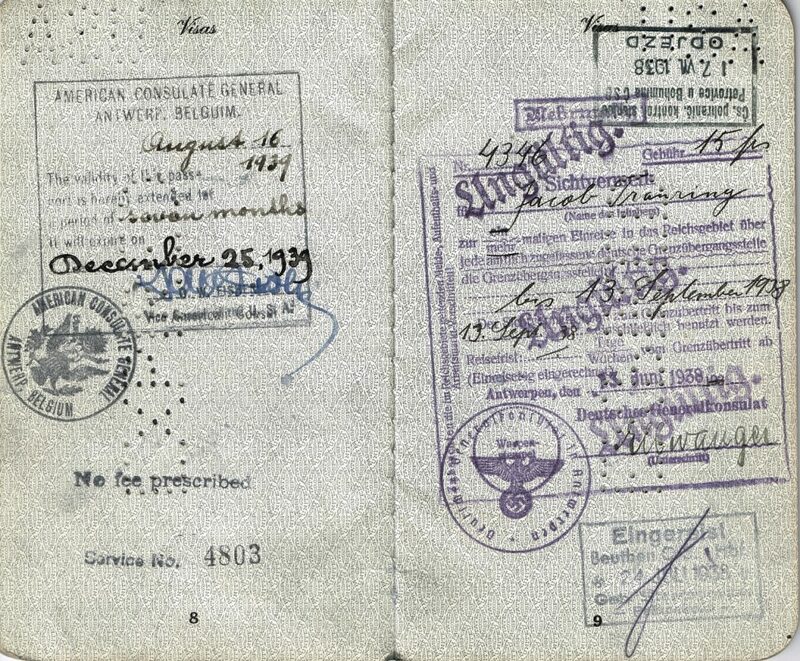 My grandfather and his brothers used their US passports to travel into Nazi Germany to try to get their family out. The reason this was possible is that even though they were Jews, they were US citizens, and at the time Germans had a lot of respect for the United States, and were still trying to get the United States to take their side in the upcoming conflict in Europe, or at least remain neutral. It’s not a secret that many US leaders admired Hitler. Most famously perhaps was the father of President John F. Kennedy, Joseph Kennedy, who at the same time my grandfather was applying for his US passport at the US Consulate in Antwerp, was the US Ambassador in the United Kingdom. It was supposedly a report commissioned by Kennedy, and written up by one of most famous Americans of the time Charles Lindbergh, that influenced Prime Minister Chamberlain not to respond to Germany’s annexation of Czechoslovakia. It was this decision that led to the Munich Agreement in 1938, and the famous Chamberlain statement that they had achieved “peace for our time”. He would travel to Germany and pick up his younger cousins. Their parents would travel separately to the border crossing, and wait. My grandfather would travel by train with only the children, telling the border guards that he was taking his cousins on vacation to the beaches in Belgium. If the border guards allowed the children to go with him, he would continue on by train to Belgium. If not, he would hand over the children to their waiting parents at the border. My grandfather was well into his 90s when he told me this story, and he did not remember which cousins he had ferried across the border. In 1938 he was only 23, so I was asking him about something that had happened at least seventy years earlier. While I would love to find out who those cousins were, and what happened to them subsequently (keep in mind that Germany invaded Belgium in 1940, so getting to Belgium was only a temporary reprieve). One thing I did find after my grandfather passed away was his passport from 1938. It tells several stories. One of those stories is his entering Nazi Germany, as he described. 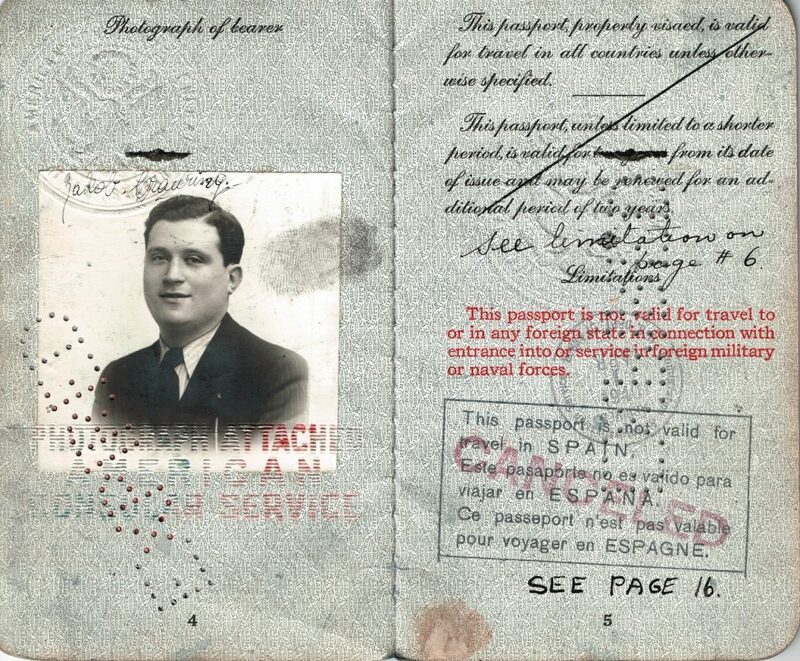 With his US passport and these visas, he entered Nazi Germany and tried his best to get his family members to safety. It’s hard to even imagine what he felt at the time. Imagine Kristallnacht just occurred, where Jewish businesses and synagogues were burnt to the ground, and dozens of Jews were murdered. Tens of thousands of Jews were being rounded up and sent to concentration camps. In this environment you get a visa and decide to enter a country that wants you dead. Maybe your US passport will protect you, but really how could you know that? So almost eighty years ago, my grandfather went into the lion’s den, and saved his family members from the Nazi regime. He would later make it out of Belgium just months before the Nazis invaded, by traveling through France to Italy and then the US. His future wife, who also lived in Antwerp, would leave Belgium literally with German bombs falling around her, make her way to France, and then Morocco and Portugal, before making it the US. That, however, is another story.